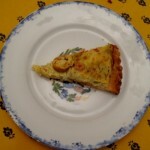 One of the simplest dishes to cook in summertime is a quiche; it can be served at a buffet, a picnic or as a light meal. This traditional French dish is highly versatile and nowadays can include any mixture of vegetables, fish, cooked meat or cheese mixed into a Migaine, a mixture of eggs, fresh cream and pepper in a pastry base. I think the most well-known is the Quiche Lorraine which is made with slices of smoked bacon. 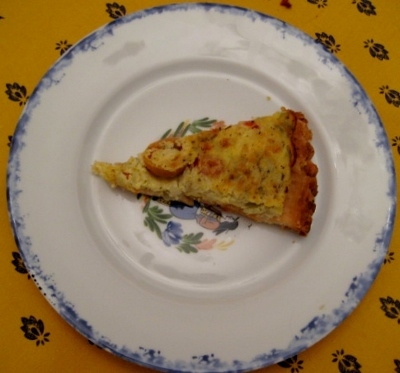 When cheese is added it is called a Quiche Vosgiennes and when onions are added it is called a Quiche Alsacienne. In this recipe I have combined shallots, baby tomatoes and Bleu d’Auverge, a soft blue cheese from the heart of France. I recommend serving it with a light red such as the Villa Ponciago Beaujolais. Cook in the oven for about 30 to 40 minutes until firm.